When Nour Elkhamra ’17 moved from Canada to the United States several years ago, she quickly realized life in America is much different from how it’s portrayed in the movies. 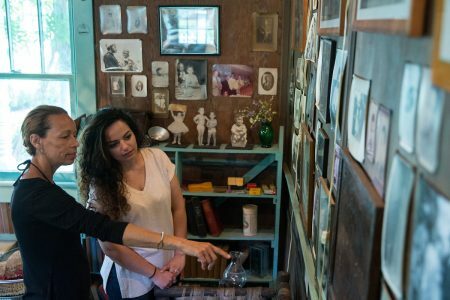 This summer, she is getting even more lessons in American culture and history as part of a Summer Research project at the Anne Spencer House and Garden Museum. Much like Spencer—a famed poet of the Harlem Renaissance, civil rights activist, and teacher—Elkhamra has a strong interest in education. Shaun Spencer-Hester shows Nour Elkhamra ’17 a wall of photos kept by her grandmother, Anne Spencer. “When I first learned about Anne Spencer, I was so impressed by her and what she was able to accomplish, especially as an African American woman in a time when she didn’t have equal rights,” she said. A curricular studies major at Randolph, Elkhamra’s goal this summer is to learn as much as possible about Spencer and her work, and craft lesson plans for the museum’s educational outreach programs. 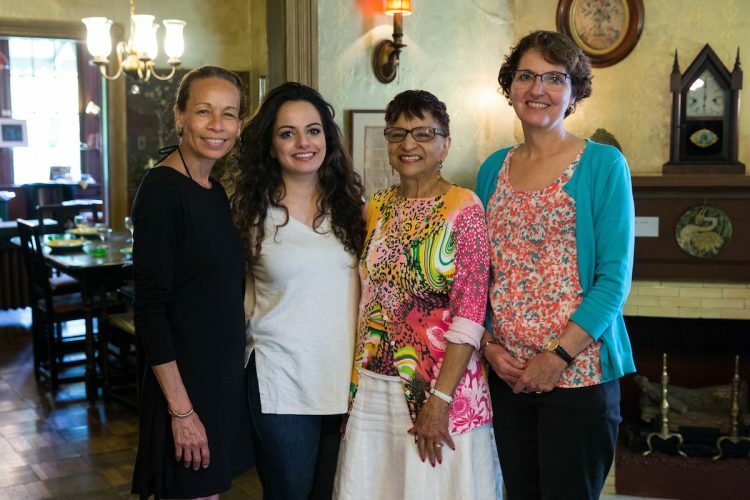 She is receiving guidance from Randolph education professors Consuella Woods and Peggy Schimmoeller, and working closely with Spencer’s granddaughter, Shaun Spencer-Hester, who serves as executive director for the museum. Among the plans Elkhamra has crafted so far are scavenger hunts for artifacts in Spencer’s house and writing exercises in which students will analyze Spencer’s poems, then create their own using the same style of figurative language and metaphors. All the activities will be geared towards local students in kindergarten through eighth grade. In addition to her work in Lynchburg, Elkhamra has also gotten to research a larger selection of Spencer’s poetry at the Albert and Shirley Small Special Collections Library at the University of Virginia. Shaun Spencer-Hester and Nour Elkhamra ’17 walk through the Anne Spencer House Garden. In the long term, Elkhamra hopes to become an administrator for one of the Lynchburg area school systems.